On the way home for lunch this afternoon, crossing over the Veterans Memorial Bridge, I stopped to look at the Deschutes. It was awesome. 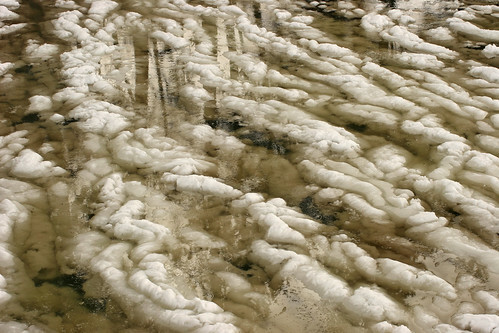 The snow which was stacked on top of the flowing river for almost two weeks had begun to melt – or coagulate – or something. The temperature had risen over the past 24 hours causing a very bizarre formation of snow meets ice meets vegetation, I was intrigued so I took a photo. It looked like a vast flow of brains, it immediately reminded me of the scene from LOTR – Two Towers, when Frodo falls into the haunted swamp of the Dead Marshes – but much colder with snow and without the occasional fire spewing from beneath.